Western medical doctors still have no effective treatment for Alzheimer’s disease, even though it was recognized over 100 years ago. But UCLA researchers are now reversing memory loss for the first time. They’ve developed a program that incorporates many of the natural approaches to health that I’ve been teaching – and coaching clients to adopt – since 2002. In a newscast on ABC News 7 and an article featured on the station’s website, Denise Dador says: “It’s not a drug; it’s not a procedure; it is a novel, comprehensive and personal approach to treating memory loss associated with Alzheimer’s.” Articles have since surfaced on many reputable news sites including Huffington Post. I find it interesting that the healthy lifestyle you are about to discover (if you remember to watch the video below ;>) is considered “novel” by this news reporter. Watch the video to see exactly what can be done to reverse what Alzheimer’s does to the brain. It’s a complex disease. In the report from UCLA’s Dr. Dale E. Bredesen, he explains that Alzheimer’s is affected by sleep, diet, even exercise. “These — and other things — all contribute to this critical balance in plasticity,” says Bredesen. Ten patients with memory-loss participated in the small UCLA trial , “MEND” , which stands for Metabolic Enhancement for NeuroDegeneration. 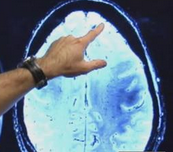 Some of the patients had patterns of Alzheimer’s that were confirmed by brain-scans. For a more in-depth (but not too technical) look at the study, click here. In the UCLA protocol, significant lifestyle changes had to be made by patients. They were told to avoid simple carbs (like white bread, white rice, sugary foods, etc). They were also told to eat only gluten-free foods and avoid processed foods. They also increased their consumption of fish, took yoga classes and meditated regularly. Additional instructions included taking melatonin at bed time and to get adequate sleep. And they added significant doses of vitamin B-12, D-3 and fish oil to their daily regimen. Six months later, nine of the ten patients had a noticeable improvement in memory. Only one patient, in the late stages of Alzheimer’s, did not improve. UCLA researchers say the findings suggest, at least early on, that changing a person’s metabolic processes can bring back memory and cognitive function. Prior to the study, six of the subjects had been forced to discontinue working due to the ailment. However, after benefiting from the new lifestyle adopted during the study, they were able to return to their jobs. Study authors say some patients were followed up to 2.5 years and the improvements remained. Plans are underway to do larger studies on this therapeutic program. For those who cannot wait and are willing and able to make significant changes in their lives, I am available as a coach via online conferencing as well as in person in East Hartford, CT.
Sweet site, super design and style, real clean and employ friendly.